Recognizing the benefits of point-of-care ultrasound (POCUS) for obstetrics patients, and building on skills taught in the DFMCH Madison residency clinics, family physicians at four UW Health community clinics are now using POCUS in their OB practice. Recognizing the benefits of point-of-care ultrasound (POCUS) for obstetrics patients, and building on skills taught in the UW Department of Family Medicine and Community Health (DFMCH) Madison residency clinics, family physicians at four UW Health community clinics are now using the technology as part of their OB practice. At the UW Health DeForest-Windsor, Sun Prairie, Odana and Yahara clinics, family physicians use POCUS as a diagnostic tool though all stages of pregnancy. This includes determining whether a pregnancy is viable, detecting fetal heart rate, assessing gestational age, determining placenta position, assessing amniotic fluid volume and identifying fetal presentation. Frequently used in other specialties, including emergency medicine, sports medicine, endocrinology and rheumatology, POCUS enables clinicians to more quickly diagnose conditions, shorten time to treatment and lower costs. Because it involves patients in their care in real time, POCUS also enhances the doctor-patient relationship and can improve patient satisfaction. For example, early in pregnancy, a family physician can use POCUS to verify a heartbeat not heard through Doppler ultrasound. Having this information available within seconds in the clinic is invaluable when the viability of a pregnancy is in question. Later in pregnancy, a family physician can also use POCUS to identify whether a fetus is in the breech position at 36 weeks. Making this diagnosis in the clinic eliminates the need for travel to the hospital to confirm position, and allows expeditious scheduling of an external version attempt to rotate the baby and avoid the need for a cesarean. Training in POCUS is valuable to the current generation of medical students and residents, who desire more of it, especially in family medicine, according to curriculum guidelines from the American Academy of Family Physicians (AAFP). It’s also a critical skill for front-line providers in rural, underserved or resource-constrained environments—clinical settings where family physicians often practice. For 12 years, residents in the DFMCH’s Madison program have learned POCUS skills in clinic and while on labor and delivery rotations. It has been taught through the Advanced Life Support in Obstetrics (ALSO®) course and reinforced with supervised scanning. In addition, the DFMCH’s Lee Dresang, MD, and Lou Sanner, MD, MPH, educate practicing physicians through a prenatal ultrasonography course that’s now offered every year in order to meet physician demand. 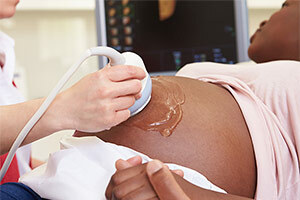 They teach the framework for full standard prenatal exams, which include biometry and an anatomic fetal survey. Learn more and register for year’s course, held October 10-12, 2018. At this summer’s Family-Centered Maternity Care (FCMC) conference, Dr. Dresang will co-teach a POCUS workshop led by Dr. William Rodney that focuses not only on maternity care skills, but also on detecting and diagnosing thyroid abnormalities and adult liver and kidney abnormalities. DFMCH physicians also use POCUS for musculoskeletal applications, including prolotherapy, and for assessing incomplete bladder emptying. “For new learners and practicing family physicians, ultrasound is becoming the stethoscope of the 21st century,” says Dr. Dresang, noting a recent Journal of Family Practice article that outlines how family physicians might use POCUS for such conditions as systolic dysfunction, pleural effusion, abdominal aortic aneurysms and deep vein thrombosis.